In 1913, L.H. Hamilton and Chester H. Beach laid the foundation for a new company. Their goal was to produce labor-saving, motor-driven electrical devices. They envisioned products built with better designs and better components than competition of the day. The original company was called the Wisconsin Electric Company. It soon became Dumore Corporation. The Dumore Corporation thrived, refining its motors and bringing together a management / employee team dedicated to building quality products and standing behind them. The high-quality electric motors soon became part of better industrial tools. Over 100 years later Dumore Corporation continues the legacy of turning creative ideas into high-quality products. 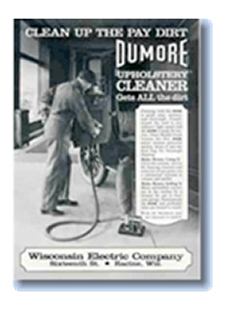 Now organized as Dumore Motors, Dumore Tools and Dumore Solenoids, our founding principles still drive Dumore today. When your project demands the best, count on Dumore!